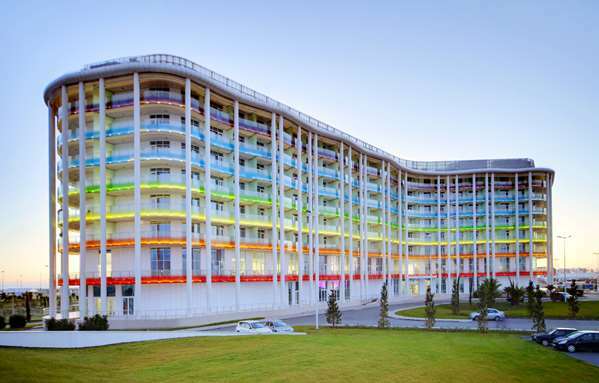 A well-known resort destination amongst Russians, Sochi has hit the international stage by winning the bid to host the 2014 Winter Olympic Games. As one of the southernmost places of Russia in the region of Krasnodar Krai, Sochi benefits from its Black Sea location and balmy subtropical climate. Sochi is one of the few places in Russia where you'll find both palm trees and snow. This pearl of the Black Sea offers glitzy designer boutiques, warm waters, and a picturesque rocky coastline to enjoy. You can step away from the mountainous beaches and admire the Stalinist Empire Style buildings, including the regal Sochi train terminal and stately Winter Theatre. The combined effect is one of grandeur as well as leisure in this jewel of the Russian Riviera. Many restaurants in Sochi are perched along the sea embankment, offering attractive waterfront views to enjoy over a plate of salmon pizza. The Central Market also offers a feast for the senses, with its bright arrangements of fruit and candied nuts. One of the most memorable things to do in Sochi is visit the Art Museum, which is constructed in an elegant classical style. Walk past its stately columns to view the largest art collection on the Black Sea coast. You can learn more about the local history by visiting the Town History Museum, which includes the famous Soyuz 9 capsule that returned to Earth after being in orbit for 18 days. In addition to Sochi's rocky beaches, it also is home to the gentle, pastoral greenery of Riviera Park. You'll find plenty of shady spots to sit and have a picnic or feed the ducks. Its most notable spot is Friendship Alley, which features a grove of trees planted by famous international politicians and cosmonauts. Vorontosovskaya Cave is one of the most exciting things to see in Sochi, with its underwater fountains and rock formations. Be sure not to miss the city's lovely arboretum, which is home to over 1500 different species of trees and flowering plants. Much of Sochi's lively nightlife is found near the beaches, but for top notch arts and culture you can pay a visit to the Festival Hall, which overlooks the sea in splendour. Sochi is a top spot for visitors arriving on international cruise ships, who can stay for up to 72 hours without a visa. You can also fly into the city's Sochi International Airport. Frequent buses and trains offer local Sochi transport and connections within the Russian Federation. There are two main stations, including one in central Sochi and one in Adler. Although the greater Sochi area hugs 90 miles of Black Sea coastline, the city centre is small enough to explore on foot. To go further afield, however, you'll need to hop aboard one of the commuter trains or buses.